The report of the AHS Cultivar Origination Commission, printed in the 2012 edition of The Online Hosta Journal and reprinted in the Registrations 2012 issue of The Hosta Journal, (Vol. 44, No. R, p. 5), credits Kevin C. Vaughn and the late Florence M. Shaw (Oct. 26, 1906 - June 30, 1975) as originators of some of Paul Aden’s registrations. 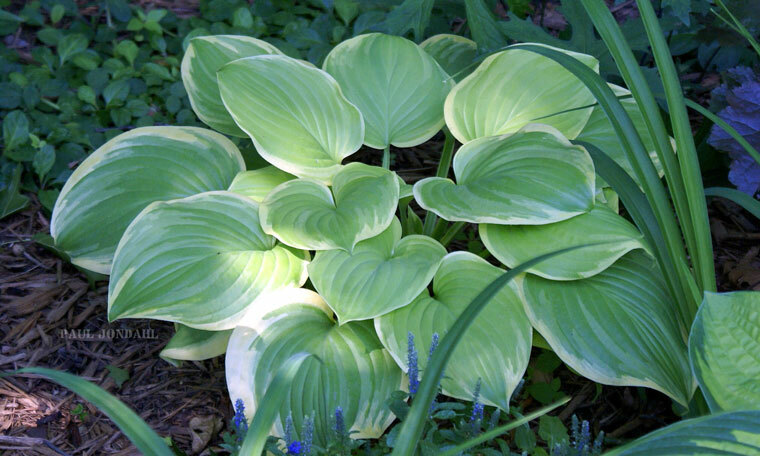 Accordingly, several originators in “Index Hosta Photographs” in the Spring 2013 issue of The Hosta Journal (Vol. 44, No. 1, pp. 81 & 82) that were listed as “Unknown”, are out of date. Vaughn should be credited as originator of H. ‘Fragrant Bouquet’ and H. ‘So Sweet’, and Shaw as originator of H. ‘Sum and Substance’. Also, Walters Gardens, Inc., Zeeland, Michigan, updated originator credits in its Summer 2013-Spring 2014 Wholesale Catalog. Now, Vaughn is cited in the descriptions of H. ‘Fragrant Blue’ and H. ‘Fragrant Bouquet’ and Shaw in the descriptions of H. ‘Blue Angel’, H. ‘Big Daddy’, H. ‘Blue Umbrellas’, and H. ‘Sum and Substance’. Previous catalogs cited Aden. The British Hosta and Hemerocallis Society is naming a hosta ‘Andy Murray’ in honor of the winner of the men’s tennis singles title at Wimbledon in 2013. Andy Murray was the first British male to win a Wimbledon Championship title in 77 years, and the first Scotsman ever to have won. In 2012, Murray won a Gold Medal at the Summer Olympics in London, also held at the All England Lawn Tennis Club in Wimbledon. 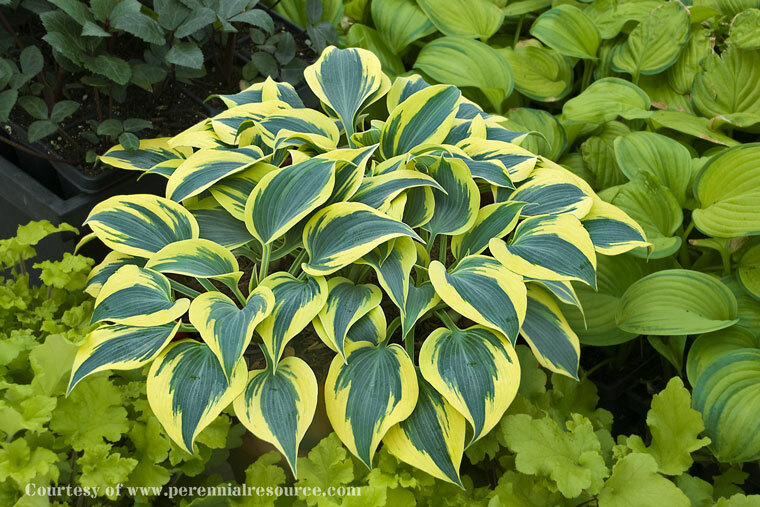 “The yellow exterior variegation of the leaves will represent Andy’s Olympic Gold Medal and the Gold Challenge Cup he received at the Wimbledon final this year,” said Diana Grenfell, BHHS Vice-President and author of several popular books on Hosta. Bob has a small number of ‘Andy Murray’, which will be available in Spring 2014 for presentation and publicity purposes in the U.K. Quantities of the hosta will be in production for future mass sales in Europe and North America. At the 2001 AHS National Convention in Raleigh, Robyn Duback of now-shuttered Robyn’s Nest Nursery in Vancouver, Washington (located across the Columbia River from Portland, Oregon), asked me, “Why are so many people pronouncing ‘Abiqua’ wrong?” She was referring to Walden West nursery’s popular hosta, with big bluish, deeply cupped, heavily seersucker leaves that Charlie Purtymun named Hosta ‘Abiqua Drinking Gourd’ and registered in 1989. Robyn should know, being from that part of the U.S. Abiqua is a Native American word, the name of a mountain stream in the foothills of the Cascades, near Scotts Mills, Oregon, where Walden West was located. The late Dr. Charles Purtymun, a former dentist who founded Walden West, used Abiqua in the names of many of his hosta cultivar introductions. 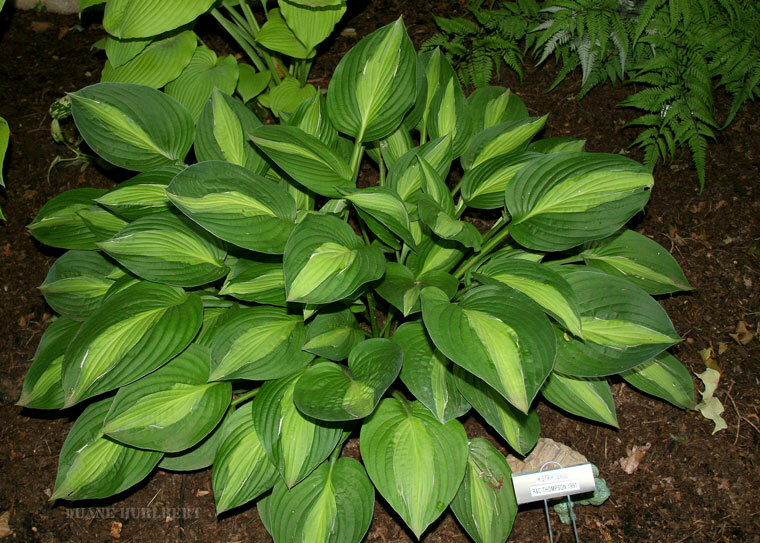 Twenty-five hostas are registered with Abiqua prefix; nineteen are listed in Hosta Finder 2013 (Sudbury, Mass. : Steven H. Greene) being available in the trade. In addition to H. ‘Abiqua Drinking Gourd’, also popular are H. ‘Abiqua Blue Crinkles’ (1999), H. ‘Abiqua Moonbeam’ (1987), and H. ‘Abiqua Recluse’ (1989). H. ‘Abiqua Drinking Gourd’ is the American Hosta Growers Association’s 2014 Hosta of the Year (HOTY). Oft-told is that this hosta received its name when Charlie saw a dog drinking water from one of the leaves after a rainstorm. Readers with long memories may recall that an item in the Fall 1995 issue of The Hosta Journal (Vol. 26, No. 2, p. 58) pronounced Abiqua differently. Also, if you go to http://www.stevensauke.com/say/northwest.html, it says AB-ih-kwa. Yet another authority (http://www.babynamespedia.com/meaning/Abiqua) gives both pronunciations with AH-bi-qua as first choice. Nevertheless, I’m sticking with Robyn’s A’bi-qua. By the way, ‘Abiqua Drinking Gourd’ is Walden West’s second Hosta of the Year selection. H. ‘Paradigm’, a sport of ‘Abiqua Recluse’ registered in 1999, was the AHGA’s 2007 HOTY. It is a favorite of Bob Axmear (Waukon, Iowa), who co-founded, with Carol Brashear (Woodbury, Connecticut), the online Hosta Library (www.hostalibrary.org). Congratulations to Victor Santa Lucia. 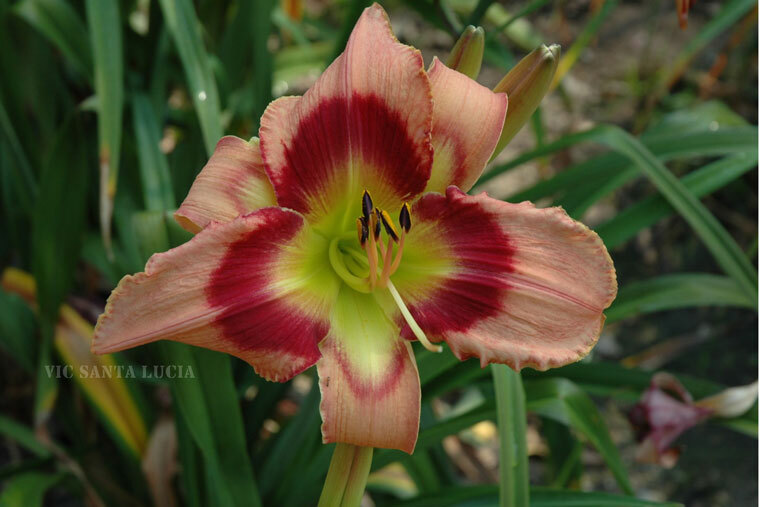 His daylily, ‘Carnival in Mexico’ (pale rose flowers with bright red feathered eyezones), won the 2012 Stout Medal of the American Hemerocallis Society. This is the highest recognition awarded to a daylily. Vic was president of The American Hosta Society, 1989-1992. He shared a house with his sister and brother-in-law, Grace and Pat Stamile, the well-known daylily hybridizers, in Setauket, New York, a charming hamlet along the western end of Long Island’s north shore. All were teachers in the local schools and took early retirement in 1991-1992. The Stamiles moved to Florida, taking their daylily business with them. Vic moved to Kings Mountain, North Carolina, forming a partnership with Van M. Sellers of Iron Gate Gardens. In those days, Van’s nursery was renowned for both cutting-edge hostas and daylilies; today it’s just daylilies. Van Sellers is well-known for introducing the Hosta Iron Gate series: Hosta ‘Iron Gate Bouquet’ (1983), ‘Iron Gate Delight’ (1981), ‘Iron Gate Glamour’ (1981), ‘Iron Gate Supreme’ (1980), and, with Vic Santa Lucia, ‘Iron Gate Special (2009). All have fragrant flowers from H. plantaginea parentage. Vic Santa Lucia is principally noted for introducing Hosta ‘Alex Summers’ (1989), a popular variegated-leaved sport of yellow-leaved ‘Gold Regal’, registered by Paul Aden in 1974. Leaves of ‘Alex Summers’ are medium green with a chartreuse-yellow margin, about 5 inches wide and 7 inches long. As I’ve pointed out before in The Hosta Journal, this sport often reverts to all-yellow leaves, like its parent. Unless they are completely removed – and I mean completely – using, for example, a sharp paring knife or X-Acto™ cutting tool, when they first develop, the entire clump may eventually become all-yellow foliage. Vic was the principal organizer of the 1983 AHS Mini-Meeting on Long Island, July 9th. It was described as a “one-day meeting with all the excitement of a ‘full’ national convention, only compressed into less time.” I attended the highly successful event and recall touring Vic’s and the Stamiles’ garden, along with Paul Aden’s in Baldwin, George Rasmussen’s in Farmingdale (mostly daylilies in bloom) and Gene Foster’s in Kings Park, all on Long Island. The Stamile-Santa Lucia property, bordered on Setauket Harbor, which majestically opens onto Long Island Sound, an idyllic picture-postcard setting. In the sunny areas the Stamiles showcased daylilies; in the shady sites, Vic grew hostas. The meeting featured a Long Island clambake, with whole steamed lobsters, clams, barbecued chicken and corn-on-the cob, held outdoors at the Stamile-Santa Lucia house on Saturday evening. Mildred Seaver’s ‘Sea Gold Star’ (1984) was the highest bid hosta at the auction. Mark Zilis paid $410.00 for it – and this was 30 years ago! Mildred’s ‘Sea Dream’ (1984) was runner-up, with a $110.00 high bid. In the “This and That: 2003” column in the Fall 2003 issue of The Hosta Journal (Vol. 34, No. 3), I wrote an item on the benefits of spent coffee grounds applied to garden soil. Principally, this addition kills or deters slugs. Several hosta gardeners I interviewed then told me they also noticed that bees seemed to more frequently visit flowers of hostas that grow in soil containing coffee grounds. The benefit, they believed, is more open pollinated (OP) seedlings occur, but since there are a lot of benefits claimed for coffee grounds, some seemingly pretty bizarre, I didn’t mention this one in my column. Well, now scientists have found that bees like caffeine. The study was published in a March 2013 issue of Science journal. Researchers reported that bees ingesting caffeine actually boosts their memory. They found that some plants, notably coffee and citrus, attract pollinators with caffeine-laced nectar, which gets the bees hooked as repeat customers. So, there seems to be credence for coffee grounds being beneficial to bee pollination of hostas. North American hosta gardeners can apply coffee to their gardens, but in European Union countries it’s illegal to do so. Great Britain is an EU member and The Royal Horticultural Society, on inquiry by some of its members, offered an explanation in its publication, The Garden, last year. There’s information on this controversial issue in the “This and That: 2012” column in the 2012 issue of The Online Hosta Journal. 2013 has been a busy year for news on bees and pesticides. Near the end of April, the European Union announced it will enact a two-year ban on a class of pesticides known as neonicotinoids, derived from nicotine, thought to be harming global bee population. These are very popular insecticides being used globally. Two major producers are the German giant Bayer CropScience and Syngenta, a Swiss biochemical company. Just a few days after the EU made its announcement, a comprehensive federal study, involving the U.S. Department of Agriculture, the Environmental Protection Agency, and other bureaus and groups, was released, saying the devastation of American honeybee colonies is the result of a complex stew of factors, including pesticides, parasites, poor nutrition, and a lack of genetic diversity. The report does not place more weight on one factor over another, and recommends a range of actions and further research. Apparently, there was not enough evidence for the study to support a U.S. ban on one group of pesticides. Also, the costs of such action might exceed the benefits. Since 2006, millions of bees have been dying in a phenomenon known as colony collapse disorder. If bees were to disappear from the globe, mankind would have four years left to live. That assertion, attributed to Albert Einstein, but perhaps apocryphal, is voiced in “More Than Honey,” a fascinating award-winning documentary, beautifully filmed, about the decimation of the world’s bee population through colony collapse disorder. Although the film doesn’t blame colony collapse disorder on pesticides, it implies a strong connection. Written and directed by a Swiss filmmaker, the movie is a 1 1/2-hour, spectacular tutorial on the biology and social behavior of bees and their exploitations in the age of industrial agriculture. It is in English, Swiss-German, and Mandarin, with English subtitles. It was shown in America in June 2013, in limited release in select cities. I understand Netflix, Hulu, and Amazon.com offer it or soon will. Also, in June, shoppers at a Target store in Wilsonville, Oregon, reported finding tens of thousands of dead bumblebees in the store’s parking lot. Investigators learned that the pesticide dinotefuran, sold under the trade name Safari®, had recently been applied to the linden trees to kill aphids. Dinotefuran belongs to the class of insecticides called neonictotinoids. The pesticide was applied to the trees while they were flowering, an action that violates the product’s instructions. The large number of the trees’ flowers in bloom had attracted a huge number of bees seeking pollen. For several years, Walters Gardens, Inc., Zeeland, Michigan, North American’s leading wholesale grower of perennials, has had a partnership with Proven Winners®, North America’s leading plant brand. Walters Gardens is now the main supplier of perennials for the Proven Winners brand. I’m sure you’ve see Proven Winners’ plants in retail nurseries and garden centers. Even big-box stores offer them. They are in distinctive, stark-white pots, usually one-gallon size, with a large PW logo and brand name prominently printed on the sides. Paul Allen Smith (born March 12, 1960) is a television host, designer, gardening and lifestyle expert. He is the host of two public television programs, P. Allen Smith’s Garden Home and P. Allen Smith’s Garden to Table, and the syndicated 30-minute show P. Allen Smith Gardens. His television show P. Allen Smith’s Garden Home has been shown on PBS-member stations and in syndication on other networks. Smith is one of America’s most recognized garden and design experts, providing ideas and inspiration through multiple media venues. He is also the author of the best-selling Garden Home series of books published by Clarkson Potter/Random House. P. Allen Smith features a Platinum Collection of specially selected Proven Winners plants – shrubs, annuals, and perennials. I doubt that Smith himself selects them; there has to be a huge number of professional people behind the scenes originating and maintaining his huge high-level output. However, if it’s Proven Winners’ perennials he’s hawking, they’re from Walters Gardens in PW containers and, furthermore, protected by issued plant patents or pending applications. Smith’s Platinum Collection selection for 2013 is H. ‘Empress Wu’PP20,774, a dark green-leaved seedling from ‘Big John’ (C. Owens - 1986) × ‘Big John’. H. ‘Empress Wu’ was developed by Brian and Virginia Skaggs of Lowell, Indiana, who registered it in 2008. (Sadly, Brian passed away in May 2011.) This hosta is claimed to be the largest hosta in commerce – and might be. It will grow to 3 to 4 feet tall in about five years in the landscape, given ample water and some fertilizer. The first big ‘Empress Wu’ clump I saw was in Kathie Sisson’s garden in Avon, Connecticut, on tour at the 2011 AHS National Convention, held in Marlborough, Massachusetts. As I and others exited the tour coach at her house, we were alerted to see the ‘Empress Wu’ clump in the backyard near the deck. Accordingly, there was a beeline to this site. I was amazed at its size and beauty, as were others. H. ‘Empress Wu’ was a principle topic of conversation when we returned to the coach. If I were asked why Smith’s Platinum Collection shifted to ‘Empress Wu’ from ‘Autumn Frost’, I’d say it was probably because of higher sales for ‘Empress Wu’. It has become very popular. What might be P. Allen’s next hosta selection? My guess is it could be Bill Meyer’s popular H. ‘Wheee!’PP23,565 – which I’ll harshly state is still unregistered in November 2013, even though Walters Gardens exclusively introduced it years ago! Its green leaves with cream colored margin, extremely ruffled from leaf tip to petiole, are notably eye catching. Further adding to its market appeal is the ruffling that is evident in juvenile plants. Also, its small to medium size is advantageous when planting space is limited. The inside front cover of the Spring 2013 issue of The Hosta Journal (Vol. 44, No. 1) has a photograph of a six-foot-high pyramid of potted hostas in our (Warren and Ali Pollock’s) former garden in Wilmington, Delaware. It was taken by Bob Olson the Sunday after the 2007 AHS National Convention, held in southeastern Pennsylvania and northern Delaware in June. The pyramid was at the rear of the driveway along the west property line, receiving full afternoon sun. Our garden was not on the convention’s scheduled tours becaues it could not satisfactorily accommodate the anticipated 450+ attendees, being quite small, with winding one-person-wide dead-end paths. Instead, on Sunday morning we invited some 50 attendees, our closest hosta friends, for a sit-down, special catered omelet and coffee breakfast. Soon after the Spring 2013 THJ issue was in members’ mailboxes, several people contacted me, asking that I identify the hostas in the pyramid photo. Unfortunately, I am not able to do this. In assembling the pyramid each year, I made significant rearrangements, based on which hostas at the time looked best for their heights and widths, as well as foliage perfection, and kept no records. Furthermore, the pyramid has not existed for several years. Nonetheless, I do recall the huge top-most plants because they were the same each year. 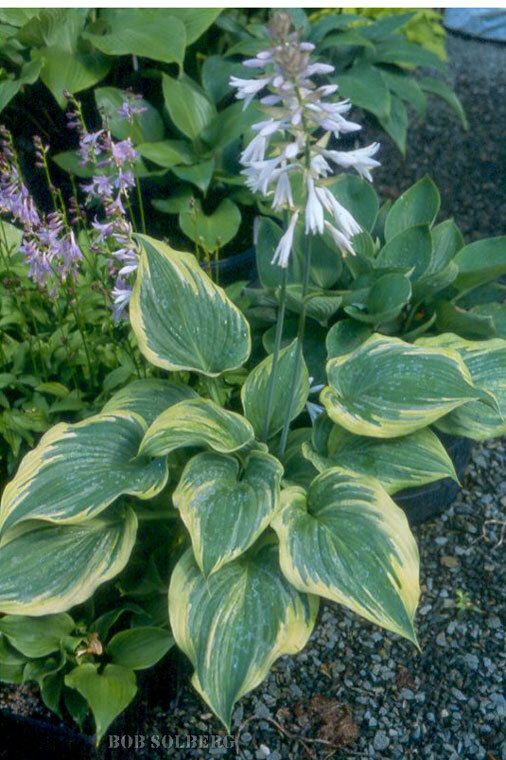 The wide-spreading yellowish-leaved hosta at the apex is Hosta ‘Golden Sculpture’ (K. Anderson - 1982). Next row down, to the extreme left of ‘Golden Sculpture’, is ‘Sagae’ (Unknown - 1996). To the extreme right, also in that row, somewhat hidden, is another huge ‘Sagae’. These three hostas were growing in approximately 20-inch-diameter, sturdy, plastic nursery pots for more than 10 years. To give them the height needed to create a tall vertical pyramid, they sit on upside-down pots of the same size. All the hostas in this photo (and also in the bottom photo on page 24 of the Spring 2013 THJ) were overwintered in our unheated garage. See “Q&A: AHS Ask and Answer” column, also in the Spring 2013 THJ, page 16, and the article titled “Growing and Overwintering Hostas in Containers” in the 2011 edition of The Online Hosta Journal. In the item titled “H. ‘Fragrant Queen’PP19,508 Is Tetraploid Sport of ‘Fragrant Bouquet’ …” in the “What’s in a Hosta Name?” column in the Spring 2013 issue of The Hosta Journal (Vol. 44, No. 1, p. 71), I stated that oryzalin, trade name Surflan®, is the pre-emergent herbicide in Preen®. It isn’t. The pre-emergent herbicide in Preen is trifluralin, tradename Treflan®. It is a different chemical from oryzalin, though there is some similarity in chemical structure. Treflan and Surflan are manufactured by different companies. I mentioned oryzalin in the Hosta ‘Fragrant Queen’ item because it probably was used to induce tetraploidy. I have found no literature reference that trifluralin would do this, too. Carol Brashear and partner Bill Meyer, who live in Woodbury, Connecticut, report that results with pre-emergent herbicides in hosta gardens are amazing. Carol has a very informative “how-to” article, with photos of the chemicals and sprayers, in the 2011 edition of The Online Hosta Journal. It’s titled “One Cold Day in March,” and you’ll find it in the CULTURE section. Also, check out Bill’s article in First Look’s Reading Room on the Hosta Library. It’s loaded with technical information. Click HERE to access article. “The key to success with pre-emergent herbicides is soil temperature. They need to be applied early in the season, when the soil is just beginning to warm up,” Bill claims. In 2013, he and Carol applied Surflan with a sprayer in their New England garden during the week before Easter (in other words, the first week in April). Because of the late spring, this was about two weeks later than in previous years. Important also is that the pre-emergent chemical needs to be watered in soon after application. Don’t wait for rain that may not come until a week or two later. My tip: Don’t skimp on application rate. Follow manufacturer’s instructions. You’ll likely be disappointed in the results, if too little of the active chemical is applied. Bob Solberg in the March 2013 issue of “The Green Hill Gossip,” his nursery’s newspaper-type catalog, has a front-page commentary, titled “Hosta Pests...The Fear Factor.” Discussed are fungal infections, in particular, devastating Petiole Rot caused by the fungus Sclerotium rolfsii var. delphinii. There are many names for this disease: Southern Blight, Southern Stem Blight, mustard seed fungus, and even crown rot. The later designation can be confusing, because it’s the petioles that are seriously affected by the fungal disease. Crown rot usually refers to leaves turning yellow and wilting, with roots turning black or brown with rot, due to excess soil moisture, excess fertilizer, high soil pH, cool soil temperature, or plant stress. Because the petiole fungal disease often is as prevalent in the northern U.S. as in the southern U.S., “Petiole Rot” or “Hosta Petiole Rot” is now the preferred name. Iowa State University helped coin the term when it studied the fungal infection in the 1990s and 2000s, because it had become a serious problem in the state. Petiole is a better term, since stem usually refers to flower stem, and rot is a more definitive descriptor than blight. Iowa State’s comprehensive studies led to Iowa State Univ. Extension, in conjunction with North Carolina State Univ. Cooperative Extension and Clemson Univ. Extension, publishing a very helpful booklet, “Hosta Diseases and Pests,” in 2005. The color photos and glossary of terms are first class. The booklet is still in print, but now is also available online. To view it, click HERE. By the way, Bob Solberg contributed the cover photo. I "googled" Petiole Rot and found that Iowa State University issued an alert bulletin on this fungal infection in 2013. Click to view HERE. “S. rolfsii var. delphinii,” the bulletin states, “apparently occurs primarily in the northern U.S., whereas a closely related fungus, Sclerotium rolfsii, occurs primarily in the southern U.S.” The Gleason Lab in the Department of Plant Pathology at Iowa State University currently has a Ph.D. candidate studying the two fungi. Petiole Rot can be very difficult to control once it appears in a production field or garden, and sclerotia of the pathogen may persist for long periods. My experience with controlling this disease is to apply a systemic fungicide a month or so after the bleach sterilization, and also to apply the fungicide in the spring for the next couple of years. There are many systemic fungicides available these days, but my favorite for Petiole Rot is Cleary® 3336®. However, you won’t find Cleary 3336, also designated Thiophanate-Methyl™, at your local retail nurseries or garden centers. You’ll have to go online or perhaps find a company that specializes in supplying the nursery (greenhouse) industry near you. Bill Meyer (Woodbury, CT) alerted me to a 1998 study by the Alabama Agricultural Experiment Station at Auburn University titled “New Fungicides Provide Superior Control of Southern Blight on Container-Grown Aucuba.” You can view it, click HERE. These researchers found that Terraclor® 75W, which was applied at twice the labeled drench rate, failed to provide an acceptable level of southern blight control on aucuba. On the other hand, ProStar® 50W and Fluazinam 500F, over a range of application rates, consistently controlled this disease. Terraclor is PCNB (pentachloronitrobenzene), an old standby fungicide that’s been overshadowed by newer, more costly chemicals. ProStar is flutolanil, a systemic fungicide developed by Bayer. Fluazinam is both the genetic name and a trade name; Emblem® is another trade name. As with Cleary 3336, you’ll likely need to go on the Internet to find suppliers of these fungicides. I need to point out that Cleary 3336, ProStar, and fluazinam are usually only available in containers of highly concentrated formulations and thus require large dilutions, so their initial purchase cost is expensive. As an example, the price on the Internet of ProStar 70, a 70% concentration, for a 3-lb. jug, the smallest quantity I could find, is about $212.00. 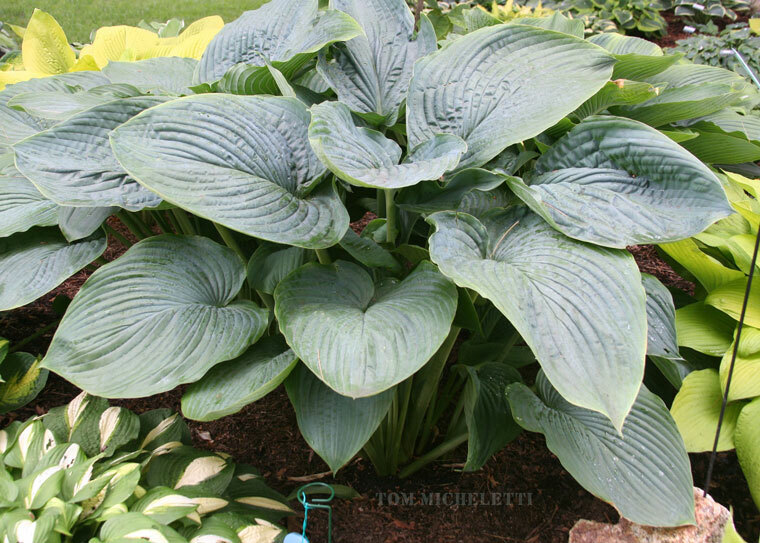 However, when diluted with water even to the label’s high-end application rate, treatment of a single hosta clump is only a couple of pennies. Kudos to Mark R. Zilis for the outstanding comprehensiveness and accuracy of information in his instant classic reference, The Hostapedia (Rochelle, Illinois: Q & Z Nursery, 2009), but somehow, on page 902, this slipped in: H. ‘Striptease’ (R. &. C. Thompson - 1991) is tetraploid. That is incorrect. Flow cytometric measurement, reported by Dr. Ben J.M. Zonneveld and me in Plant Biology 14 (2012) 972-979, indicates ‘Striptease’ is not tetraploid, not even ploidy chimera. It is a simple diploid (L1-L2-L3=2-2-2), as is H. ‘Gold Standard’ (P. Banyai - 1976) from which it sported. In Mark Zilis’s new The Hosta Handbook, Second Edition (Rochelle, Illinois: Q & Z Nursery, 2013), ‘Striptease’ is correctly listed as diploid, and in the Second Edition of Mark’s The Hostapedia, expected to be published in 2019 as two volumes, ‘Striptease’ will be listed as diploid. The Hostapedia further states that ‘Striptease’ has “notably thicker foliage” (than ‘Gold Standard’). Don Rawson, Comstock Park, Michigan, measured the leaf thickness of ‘Striptease’ and ‘Gold Standard’ using a precision micrometer. For both, Don found leaf thickness was 0.0080 to 0.0105 inches (0.20 to 0.27 mm), which is typical for diploid hostas. I queried Dr. Zonneveld about this popular, attractive sport of ‘Gold Standard’, exhibiting a wider margin than ‘Gold Standard’, and also a white line between the yellow leaf center and green margin (L2). He speculated that the increased margin has to do with the L2 being white. The L2 divided slower, leaving space for the L1 to divide more rapidly and occupy the space left by the white L1. Possibly you’re not aware, so I want to call your attention to a most informative article Bill Meyer, Woodbury, CT, wrote in 2010 on the popular iron phosphate-containing slug and snail baits. It’s in the online Hosta Library’s Reading Room: http://www.hostalibrary.org/firstlook/RRIronPhosphate.htm. If you use these pellets and have pets, especially dogs, I strongly recommend you examine Bill’s detailed assessments. Actually, how safe are these pellets in the garden? Iron phosphate is edible and non-toxic to terrestrial mollusks when consumed alone. Addition of another ingredient causes iron phosphate to be fatally toxic to slugs and snails. It is iron (ferric) EDTA that is toxic to slugs and snails. Iron EDTA reportedly is toxic to animals, as well. Yet, and this is most puzzling, labels of iron phosphate-containing slug and snail baits say nothing about EDTA, even though it’s an essential ingredient. EDTA is not identified, apparently because it is classified as an inert ingredient. So, although the labeling of these pellets certainly must have passed regulatory scrutiny, the information seems untrustworthy. Bill Meyer alerted me to a bulletin by Oregon State University, published in 2013. It cites molluscide animal exposures reported to the National Pesticide Information Center (NPIC), funded through a cooperative agreement between OSU and the U.S. Environmental Protection Agency. It specifically mentions dogs having died from eating these EDTA-containing pellets. Click HERE to view it. A mollusk control device called “The Slug Bell,” introduced in the U.K., is cleverly designed to protect pellets from watering, rain, mist, dew, and dampness. Also, it keeps poisonous pellets safely from children, pets, and wildlife. Slug Bells are easy to assemble and easily moved from one place to another in the garden, and can be used in containers, even small ones. Further, and this should have considerable appeal, they are attractive as garden ornaments. Each bell is individually hand-painted and comes in different designs. If Slug Bells are in your garden, expect to receive “What are those?” remarks from visitors. For a demonstration of how The Slug Bell works, there’s a YouTube video. Click HERE to view. The company’s website is www.slugbell.com and gives sources in the U.K.
Do any AHS members in the U.K. have experience on effectiveness of The Slug Bell in controlling slugs or snails? If you do, please contact me by clicking HERE.